Welcome to Lake Norman, NC! 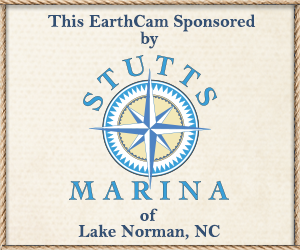 EarthCam and the North Carolina Wildlife Federation (NCWF) bring you a live streaming bird’s-eye-view of an osprey nest located on Lake Norman in Mooresville, NC. This camera highlights the work of NCWF’s local chapter, the Lake Norman Wildlife Conservationists (LNWC) - a community based organization established for the purpose of environmental education, appreciation of wildlife and natural history, and conservation of wildlife habitat and natural resources. This nesting platform, located in the shallow water surrounding a small wooded island, is one of over seven-dozen platforms constructed by the organization over the past decade. NCWF is on "Egg Watch" as the chicks should arrive any day now. In the meantime, you can help name the parents that have been made famous by this EarthCam! The names with the most votes at the time of the first hatch will become the official names of this osprey couple that returns to the same nest year after year. The chicks will arrive soon...so, cast your votes ASAP!